In today’s article I want to focus on what are some of the best portable food scales to choose from. Not all food scales have to be portable but in many applications they tend to be moved around. It could be for travel or it could be a commercial scale that you take to a market and weigh product for sale to your customer. If you’re familiar with our writings from the past, we focus a lot of our attention on past success. Scales that we have sold and have been solid performers rank very high on our list of importance. 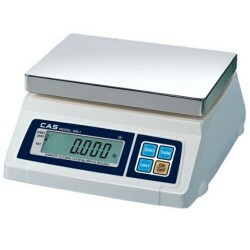 Therefore when we are discussing the best food scale to buy, we have to mention the CAS SW-1 bench scale. This versatile scale is available in four different capacities (5 lb, 10 lb, 20 lb & 50 lb) and is a very practical scale. The truth is that probably three quarters of the businesses in the United States could probably use the CAS SW-1 scale for multiple uses during a normal business day. Another scale that we like is the Intelligent AGS series stainless steel wash down food prep scales. These scales are available in a wide variety of capacities and are priced competitively. There you have it, our list of the best portable food scales on the market today. Other honorable mention choices are: Doran PC400, Detecto AP series, Brecknell counter top scales, Rice Lake Versa-Portion, and Ishida iPC series.